Opening Reception: Friday, October 9, 5:00 p.m. – 7:00 p.m.
Visit the Pratt Museum Special Exhibits Gallery during October to preview artwork to be included in the 30th Annual Ritz Art & Experience Auction. 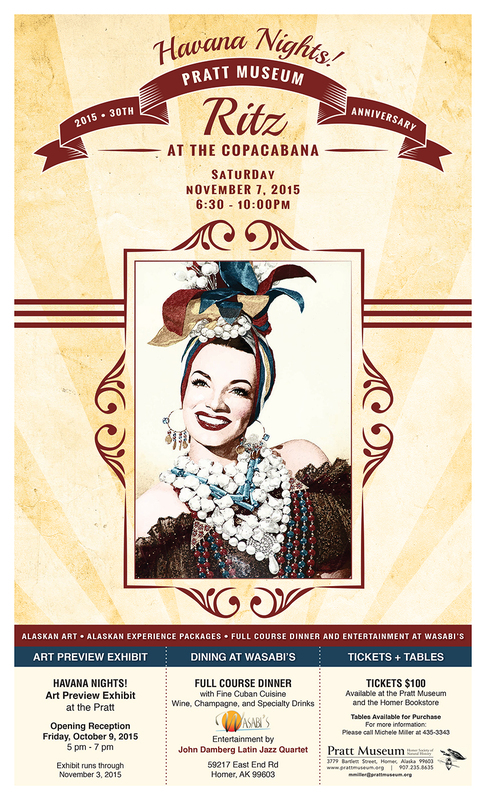 The dinner and auction event, which will be held on Saturday, November 7 at Wasabi’s, will include a live and silent auction, featuring artwork and other items donated by artists, businesses and individuals throughout Alaska. All funds raised at the Ritz will help the Pratt Museum continue to increase the diversity and quality of its exhibits and programs. For this 30th Anniversary Ritz, we’ll be celebrating Havana Nights! Ritz at the CopaCabana. Celebrating the 1940s and 50s that was Cuba in its heyday, this year’s Ritz will include Cuban food, music, dancing, diamonds, pearls, bright lights, rum, and cigars (to take outdoors)! For more information, call Michele Miller at 435-3342 or e-mail mmiller@prattmuseum.org.